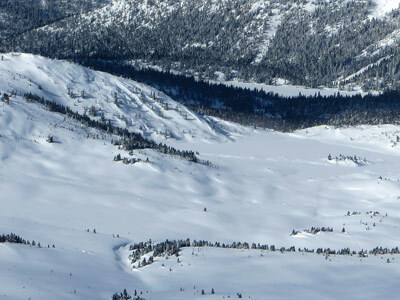 To share any info your have on backcountry skiing at Sunshine Ski Resort, or to get the lowdown from others, check out our backcountry skiing forums on the region. 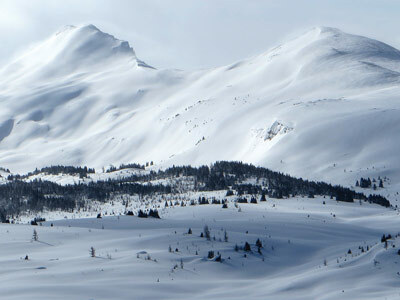 Tours in and around the Sunshine Village Ski Resort offer big snowfalls, stunning views and grand adventure. 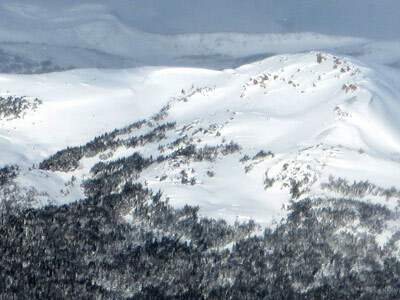 Located on the continental divide, the high peaks of this area steal the cold dry snow from southwesterly storm clouds. On a clear day views of Mt. Assiniboine (Matterhorn of the Rockies) and neighbouring peaks are breathtaking. In 1998 the world famous Delirium Dive freeride zone was opened and named among the Top 10 Off Piste destinations on the planet. In 2003 The Wild West joined as another big mountain skill testing arena. 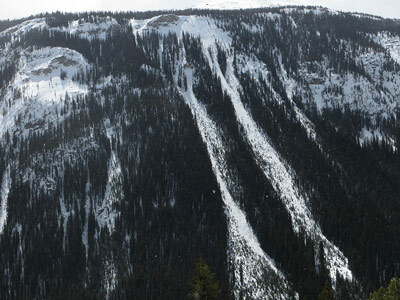 Both areas are generally avalanche controlled but localized slides to size 1.5 (or larger) are possible. 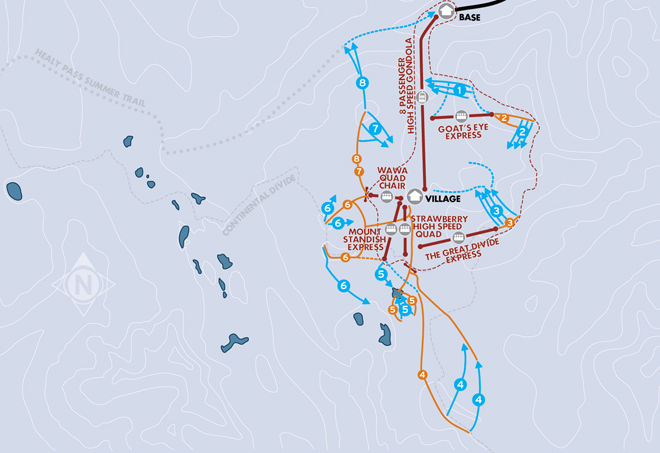 All of the routes below are in a shortened format, the full versions can be found in our Lake Louise Sunshine Banff Ski Touring Guide which you can pick up for a bargain over here. If you wish to access tours outside the area boundary it is permitted to skin up through the resort (as it lies within Banff National Park) however it is at your own risk. Stick to the edges of the piste, give right of way to downhill skiers and watch for snowcats, snowmobiles and winch cats with long, faint cables extending uphill. Always obey any area closures while inside the resort boundaries. 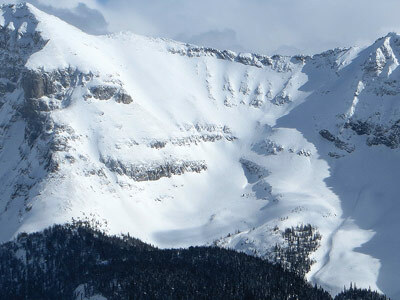 Be very well prepared and be sure to check out the Parks Canada Avalanche Forecast web site for conditions in Banff National. Have a look at the routes, buy the guide and play safe! As the name implies you are in for an adventure here. A long rock band runs north from the treed “Hell’s Kitchen”. The Kain Cliffs have no skiable breaks but north of this lies four obvious couloirs. Consider doing the easier Wheeler’s first and scout the harder lines from the traverse below. These six double black diamond runs are a good warm up for the Wild West and Delirium Dive and a nice place to take in the sun on a cold day. From the top of the Goat’s Eye Chair there are three access options. 1) The “Walking Track” is a boot pack that leads to the base of the upper cliff band to ski the “Far Side” or “Think Again” from the top. 2) The level Cat Track can be skated to reach the “Wild Side” or the middle of the Far Side & Think Again. 3) the Low traverse from the top of "Clevage". 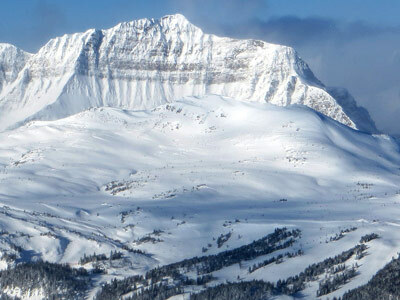 The place that defined off-piste adventure skiing in the Rockies! Expect exposure, steep skiing, limited signage, and hazards like rocks and cliff drops to be UNMARKED. At the start of the bootpack, your mandatory transceiver will signal the gate to unlock and then you best know where you are heading as there are over 16 routes to ski. This long impressive double humped camel’s back is seen easily from Lookout Mountain. The pointy Mt. Assiniboine is visible in the background on a clear day. Quartz Ridge or the taller “Quartz Hill” to the SE offer steep consistent skiing on open alpine slopes when stability is good but are avalanche prone and often slide during natural cycles. Looking for some turns in fresh snow close to the resort? The Rock Isle Lake area is a mini playground with lots of fun exploring to be had on shorter slopes. Watch for terrain traps and be mindful in poor visibility. 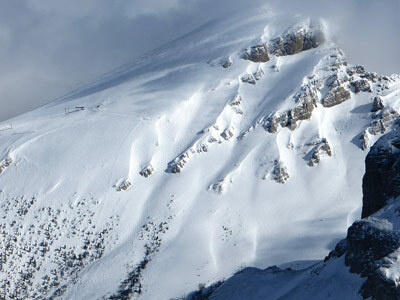 This low elevation alpine summit offers a variety of skiing on multiple aspects but is exposed to strong winds at times creating tricky skiing and avalanche prone wind slabs. Its proximity, peak bag appeal, and opportunity for freshies make it popular. Wawa Ridge offers lots of close options, although fatalities have occurred here. Wind and sun effect on these SE slopes require careful planning. 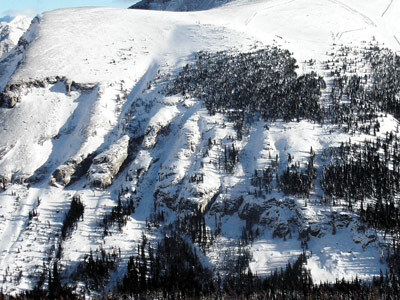 The rocky Repeater Slopes demand careful scouting and may be best left for the better stability of late season. Do not even attempt this if you are not totally confident in your skills as folks have been cliffed out and benighted here before! This is a 700m run down mega avalanche paths with major consequences, but if your timing and judgement are sound you will LOVE it.